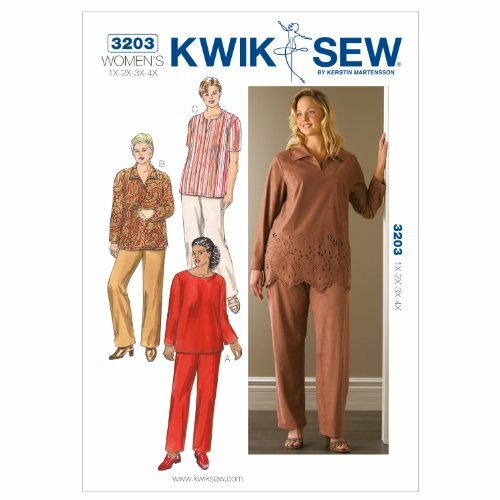 The Women's Tunics & Pants are designed for light to medium weight woven fabrics. We suggest cotton, cotton types, linen, crepe, rayon, challis, silk, silk-like fabrics. Women's pullover tunics and pull-on pants. The tunics have bust darts and side hemline slits. View A has a boat neckline finished with facing and full-length sleeves. View B has a front neckline slit and collar, and full-length sleeves. View C has a front neckline slit finished with facing and short sleeves. The pants have pockets in the side seams and an elastic waist.